Don't let the name fool you. Hiding behind that red Avegon Inc. logo lurks the NEC NT-7H, one of the first two transistor radio models NEC released simultaneously in March 1957. 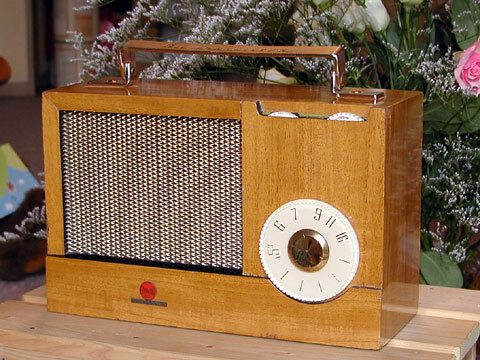 The development concept behind this 7-transistor model was to build a cordless radio for the home that achieved the sensitivity of a 5-tube radio, and that delivered quality sound with ample volume. The NT-7H, thus the Avegon, features a large 5-inch round speaker and distortion-free output of 150 mW. Sure enough, even 44 years later, this radio plays strongly and with exceptionally good sound. It also weighs about 2.9 kilograms, (6-1/4 pounds). I haven't found a model number for the Avegon version of this radio yet. And, while the NEC version sold for 23,000 yen in Japan, I have no idea what the price tag on the Avegon would have been in the Philippines. In fact, I've yet to learn what arrangement NEC had with Avegon to sell this radio in the Philippines. There is no mistaking that the chassis, tuning dial, carrying handle and all other fittings are NEC parts straight from Japan. I suspect the entire radio is from Japan, yet the possibility exists that the wooden cabinet or some assembly was done in the Philippines. Again, I can't speak about the Avegon, but do know that the NT-7H was available in a walnut or a mahogany cabinet.